Loughton is first mentioned in a 1062 charter of Edward the Confessor, shown as Lukinton. The word 'Loughton' derives from an Enclosure e.g. Settlement, Farm or Estate associated with Luhha. For example "Luhha's farm". By 1086, when surveyed for William the Conqueror's newly commissioned Domesday Book, it is listed as Lochintuna and Lochetuna where it is the smaller of the three parishes of Alderton [Alwardtun - Ailward's Town] and Debden [Tippedene]. Later, in 17th century Deeds and Session Rolls it is sometimes written as Lucton or Luction. We can conclude with some certainty that the area was to some extent inhabited much earlier due to the close proximity of Loughton Camp, an Iron Age settlement which lies half a mile to the North West of Brittens Cottages and Ambresbury Banks, similarly only a short hike through the forest, which would have covered much more of the surrounding area at that time. One of the most picturesque and ancient areas in Loughton is the York Hill conservation area. 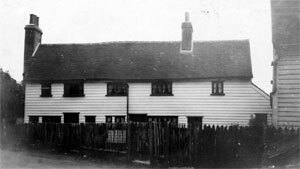 The row of weatherboarded Cottages at the corner of Pump Hill (previously Lyngs lane) and York Hill date to 1585 and are amongst the oldest surviving buildings from Loughton's long history. They are of constructed of thick oak beams in a box frame, laid out in 3 bays. The building may have originally been constructed as a barn, although the double storey construction may contradict this. The land appears to have once been referred to as the 'Ryddons' or 'Reddens' a tenement of about 9 acres. At times it appears that just the dwelling and one close (2 acres) of land were sold and then rejoined as a 6 acre tenement. The cottages still retain original features such as the carpenters numerals (from the Fraymngplace where it would have originally been created), Wattle and Daub and old Laths. Research carried out in 2005 (full notes here). Copies taken of original documents. Not all records pertain directly to Brittens, but are supporting research relating to the owners other interests etc. See Definitions Below for explanations of language. 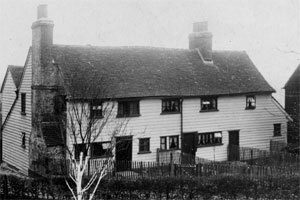 Held before Thomas Luther and John Collen, high constables.... Loughton. John Elimente and John Bretton, sworn. 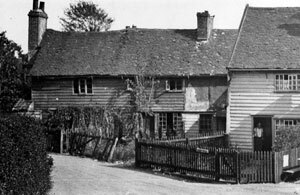 Admission (With translation) of William Britten, upon surrender of his father John Britten... Cottage and two pieces of land, copyhold Manor of Loughton. Indictment of Thomas Britten of Loughton labourer,11 Sept, there stole "xij peeces of mitton" worth 20shillings, belonging to an unknown man. Pleads not guilty; acquitted. Witnesses: Richard Rogers, Thomas Kinge. [William Britten has probably sold his cottage and 2 acres to Robert Dawgs at the same time] It is not clear if the Cottage and Toft and land are one entity or if they are separate. The toft could indeed be referred to as TyleKill as it may have provided the clay. There was a 'TileKiln' at the bottom of York Hill some distance away, however the use of the word toft could suggest that it is not this being referred to. I believe that with the transfer of the land here and above and subsequent Admission of Thomas Dawgs to the Reddens tenement and adjoining 9 acres, this is in fact Brittens Cottage and the toft on which it sits plus the land. abutting North and East upon Lings, in can be no other]. Geo[rge?] England, Robert Dawges, both of loughton, and Thomas Everd of Walthamstow, yeoman; England to answer for begetting a male child of Margaret Ray singlewoman, which is non chargeable to Loughton and to do what the Court shall enjoin. Recognizance of Robert Dawgs carpenter and John Stocke yeoman, both of Loughton; Dawgs to appear. Presentment by highway surveyors of Loughton. Labourers that refuse to do their highway work this year 1647 "from Goldings Hill to Trapce hill" for one half of the Parish:- ...George England, .. Robert Dawgs carpenter, ..William Britten... The cart cannot be returned because there is no gravel "digged". Admission of Joseph Dawges, upon surrender of Thomas, Elizabeth and Robert as in 194/48. Recognizance of Robert Dawges of Loughton esq. ; to answer for refusing to excecute the office of constable of "the parish of Loughton" for the year amusing being legally presented "at a COurts Losts for the said Manner". Also copy admission of John Eyres, upon surrender of John Bale, gent. Does the Lingwood family have any connection to the origin of Lings / Lyngs Lane (now Pump Hill)? Ling is Yorkshire for Heather and originates from Norse / Old Icelandic 'Lyng' (heather) which may describe the type of soil in which it grows or the relatively light weight of it as a fuel for fire. Swedish for heather - Ljung. Anglo Saxon Lig (fire) could have a similar derivation with respect to heather being used as fuel for fire or merely referring generically to fuel (i.e. wood). If I recall correctly, The Chapman and Andre Map of 1777 shows Brittens Cottages but not the Gardeners Arms Pub building. Some people say the Gardeners Arms is contemporary with Brittens, however neither the maps nor the construction methods appear to support this. The corner opposite the pump [Britten’s Cottages] is a rookery. I offered to buy it from Free and he asked £500 for the block, which was valued at £210 as a fair price. The cottages were made originally out of an old barn and are back-to-back. However, we don’t seem to develop any more disease there than elsewhere, though I hear there is a good deal of overcrowding. 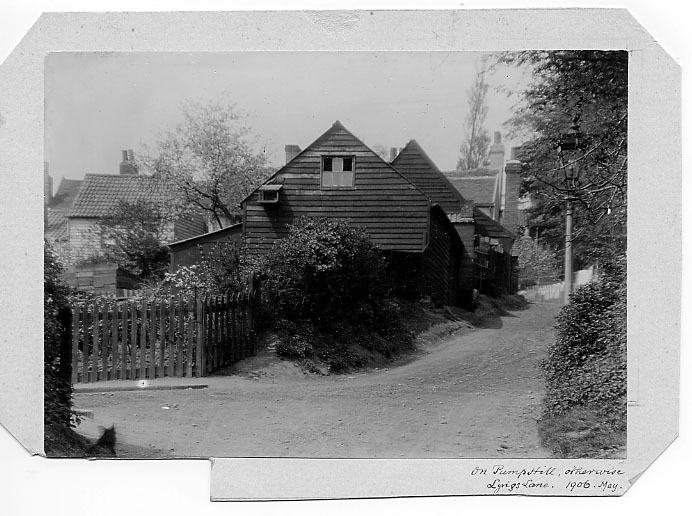 Some old picturesque cottages have been condemned – one group opposite the Crown, another in the Hole, and another at the corner on the top of Pump Hill. The latter [Britten’s Cottages], 5 cottages back-to-back, are now (Mar 30) being patched up by Greenaway for old “Bustler” Free, the upper part, which was daub, being replaced by feather-edge board. Early form of conveyance, bargainee becomes seised of the land. used to ensure adherence to conveyances, the person was 'bound over' to ensure payment, a forfiet due on non compliance. The transfer of land from one party to another. Land belonging to the Manor (ownership by the Lord of the manor). Abolished in 1922 by Law of Property Act and replaced by freehold. Generic term for men of various class (inc. barons / esquires), including commissioned officers above a certain rank. generally a dwelling-house and its curtilage, garden and orchard, buildings belonging to it and the close on which it is built. return of property (when leasehold) to the Lord of the Manor or lessor. A knoll or hill. Possibly a site of a previous messuage or of a burnt or decayed house.